If your phone isn't "smart", don't worry — here's a "classic" app which may still work on it. 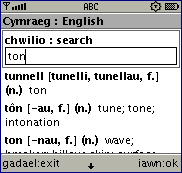 Load a bilingual dictionary onto your Java mobile phone, and never be at a loss for words again. Much more portable and less obvious than a pocket dictionary. Simply download a dictionary below, put it on your phone, and go. The whole dictionary is stored on your phone — it doesn't connect to the Internet — so once you've downloaded it, you can use it as much as you like at no cost. Choose a dictionary link from the table above. 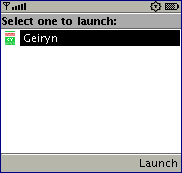 Save the JAR file onto a computer, then transfer it to your phone, e.g. using a cable or Bluetooth. Then open the JAR file on your phone and start the applet — the exact way to do this depends on your handset, but your manual should explain. To search for a word, just type it into the dictionary's search box, then select "OK" (see screenshot). The dictionary will search in both languages, so you can type in either. The exact appearance depends on your handset. In our experience the dictionaries run on the majority of Java-enabled (J2ME) devices, but we cannot make any guarantee for your particular device. ALL MATERIAL ON THIS SITE IS PROVIDED "AS IS" WITHOUT WARRANTY OF ANY KIND, EITHER EXPRESSED OR IMPLIED, INCLUDING, BUT NOT LIMITED TO, THE IMPLIED WARRANTIES OF MERCHANTABILITY AND FITNESS FOR A PARTICULAR PURPOSE, TO THE EXTENT PERMITTED BY APPLICABLE LAW.